An exciting new addition to the Farm Shop is The Deli Bar. An eatery and wine bar for customers who enjoy the hustle and bustle of the shop, whilst sipping on fabulous wines and nibbling on tasty foods. Menus are available for breakfast until 11.30 including bacon sandwiches, croissants and pastries to be enjoyed with a coffee or even a glass of champagne. After 11.30 enjoy fresh salads, Deli boards brimming with delicious deli produce, freshly prepared deli sandwiches and bakery products. The menus have been created using the best produce from The Hollies Delicatessen. 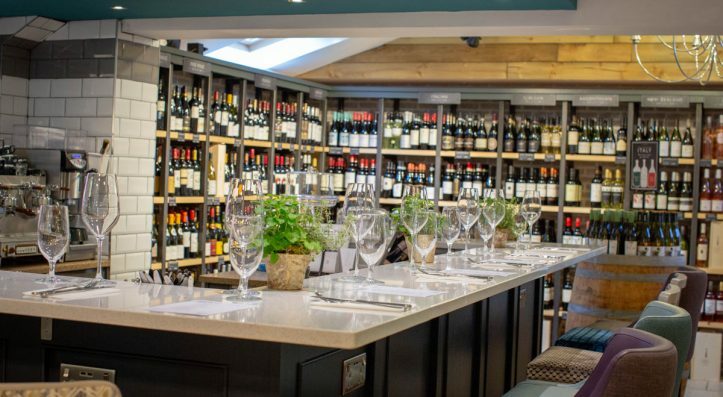 Sit around the bar, enjoy the ambience of the Farm Shop with great food and maybe find out more about some of the great wines that we have available. Our wine selection has been selected by the Directors working closely with expert wine importers to bring you a great selection of wines. Find your favourite bottle of wine to buy for home from the farm shop.